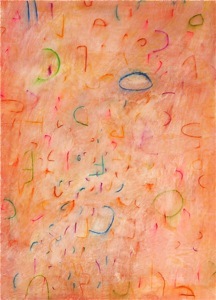 Color is central to my painting, including the deeper foundations and interactions that lead to structural coherence, a construct somewhat influenced by the raga systems of the Indian subcontinent which link color combinations in painting to specific harmonic structures in music are tied to a mood, time of day. These are somewhat analogous to the Western concept of a musical mode, except that distinctly different ascending and descending scales are recognized within the same rag. I’m not sure there is such a direct link between painting and music, but certainly a somewhat analogous structuring is possible, something musical, as a structuring principle. After 2008, my ideas on chromatic structure have moved toward something closer to Stockhausen’s vocabulary of harmonics where fundamentals set the shifting harmonic content for an extended improvisation. Increasingly this has morphed into the use of small clusters of chromatic “notes”, or signs, to produce shifting chromatic relationships, much the way harmonic relationships shift within a complex rhythmic structure as in the music of Kamran Ince and other younger composers. In broader terms, these approaches are not unlike the use of shifting harmonic structures in a free improvisation of flamenco by, say, Paco Pena, or the modal improvisations of Ornette Coleman and Miles Davis. Similarly, I conceive of painting as a free improvisation in the moment, suiting my mood, but conducted within a precise, deeply studied and rigorous set of chromatic relationships that are known beforehand. I call these sets of relationships chromatic modes: each mode being made up of one or more color clusters or “scales” [though of course the analogy fails when one tries to impose progression and resolution or any other attribute dependent on time], or, as I prefer to say, fundamentals [this is where Stocckhausen’s ideas come in]. That is, these clusters or fundamentals may be further tempered, or fine-tuned, by nuanced additions of other pigments to create the final mode of the painting. These chromatic structures are inherently abstract, and personal, though, as in Indian rags or Western musical modes, they tend to suggest a certain range of moods and situation. On top of these chromatic structures I superimpose and ground them with signs reduced to iconic form, to the point where they often can be read in more than one sense.. A multiple visual trope if you will, or as the Max Ernst would say, a multivalent sign. Or deny sense altogether.